A spectacular tour that takes you to the most exclusive waterfront developments in the region - The Palm Jumeirah - with attractions such as the unique residential areas, The Atlantis and more - experience it by sea and then onwards to one of the World's Wonders and Dubai's treasures- Burj Al Arab - the fabulous 7 Star Hotel.Key Sights : Dubai Marina,Bluewaters,Ain Dubai,JBR,Skydive Dubai,Palm Jumeirah,Atlantis,Burj Al Arab,Madinat Jumeirah. The Ultimate Dhow offers an intriguingly different view of this amazing city - a portrait of the new character of Dubai and the 8th wonder of the world, The Palm Island. We're offering a 2 hour Dinner Cruise from 8:30pm until 10:30pm everyday along Dubai Marina and the Palm Island. 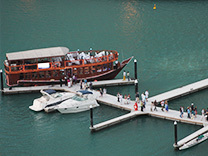 The Ultimate Dhow is located at the west side of Dubai Marina Yacht Club. After departing from Dubai Marina Yacht Club, we will be cruising the Dubai Marina channel with the Dubai Marina on one side and the Jumeirah Beach Residences on the other side. You will have amazing views of all the attractions and landmarks in that area. Then, we will enter the Palm Island were you will be able to see the buildings and villas of The Palm Island as well as the Atlantis Hotel on one side and the beach resorts on other side. The Burj Al Arab Hotel will also be visible across The Palm. 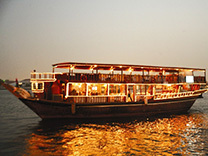 This is the only Dinner Dhow cruise available in the marina. 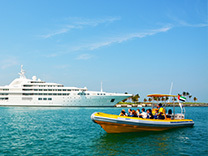 And it's also available on private charters and corporate events.